The Sigma S218 2700W Active Dual 18" Subwoofer by dB Technologies is equipped with 2 x 18" woofers and a Class-D 2700W peak power amplifier. It is designed with a bass reflex enclosure to reinforce the overall bass output for live and installation applications. 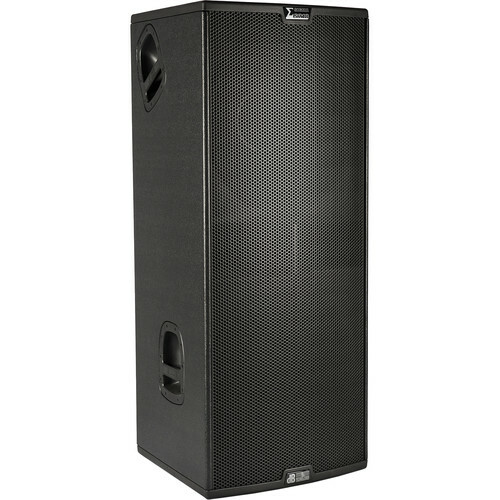 The Sigma S218 features dual XLR inputs and outputs that allow for mono or stereo configurations. The subwoofer also provides on-board phase and delay controls as well as dedicated DSP controls that allow you to configure the system to make the most of your subwoofer. LED indicators provide you with visuals for a power protection circuit and audio presence through the speaker. You can create speaker stacks with this sub using a dB Technologies base accessory (sold separately).